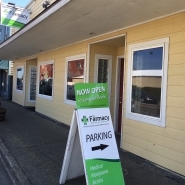 The Farmacy LLC Is a locally owned and operated Marijuana Dispensary serving both Medical patients and the general public over the age of 21.At The Farmacy we Stock Marijuana Flower, Edibles, Concentrates & extracts, clones and seeds. Before stopping in be-sure to check ahead Via our online menu, this will ensure we have the product that you are looking for https://mmjmenu.com/dispensaries/7694 . We source many of our products locally here on the oregon coast often featuring strains of flower grown by our own employees in The Farmacy Garden; or from local producers throughout the state of Oregon. We Make sure to balance Quality, sustainability and cost to ensure that all of our customers can find a product that both suits their needs, and doesn't leave you with buyers remorse. We invite you to come experience our level of service, and to aid us in supporting the local economy while we all take part in paving the way in this new and exciting industry.